whether the station or object is within a certain radius of a latitude/longitude position. by the symbol of the station or object, as specified in the messages sent by the station. by the original sending station's callsign. by the specified destination of the message (except for Mic-E encoded messages, which use the destination callsign to carry the latitude, most significant digit of the longitude, North/South/East/West indication, and station status bits). by the callsign of the last station to digipeat the message. by the arbitrary category of the station (weather, mobile, digipeaters, object, or none of the above). by the TNC or APRS-IS port which brought the APRS packet into YAAC. by the Mic-E status code (if any) of the APRS position message (MicE or text position using the APRS 1.2 extension). miscellaneous filterings such as maximum time since the message was received (selectively not applicable for played-back log file packets), whether the message indicates a human operator at the sending station, whether the message has priority or emergency precedence, whether the message was received in real-time from RF or the Internet or was played back from a log file, and whether the station is within local RF distance to the station running YAAC. If using the signaling facilities of YAAC to report when stations enter the defined local territory of this station, the range limit and center position defining the local territory can be specified. Which sending stations should be blacklisted from being digipeated or I-gated by this station. Normally, you should not need to use this. However, because the licensee of a station is legally responsible for the transmissions of that station, this gives you the ability to prevent re-transmitting other stations that you have determined would cause you to be in violation. Initially, the blacklist is empty. You can type in a callsign-SSID combination and click the Add Callsign button to mark that station for blocking. 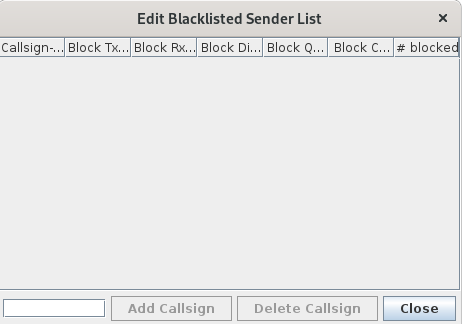 Similarly, if you determine that the station should no longer be blacklisted, you can select it on the list and click Delete Callsign to remove it from the blacklist.